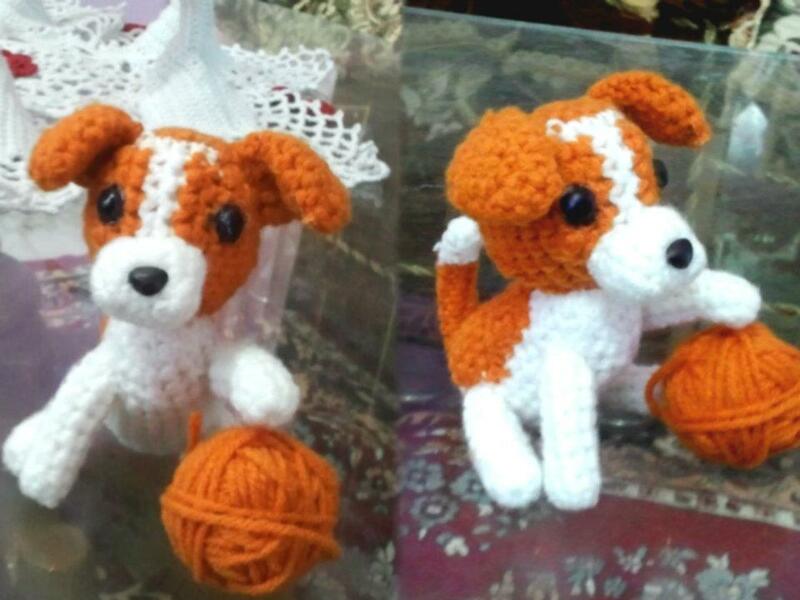 What can i say about amigurumi dogs,except this- I AM SERIOUSLY ADDICTED TO THEM......I just could not resist making this terrier when i saw the pattern in "Ami Ami Dogs-2" Book.I love how it turned out.I made my dog a little different from the original pattern.At first i started as the original pattern directed,then i get an idea to change its paws to look like he is playing with a ball.Then i thought why not let him play with the yarn-ball.....After all Why should Cats have all the fun with yarns? !!! stuff pieces with fiberfill or yarn scraps the same colours as the yarn you used to crochet. sew pieces as the diagram shows. the diagrams are actually just like american or British st diagrams with the x being a sc and the ^ being an inc and V being a dec. the 0 is a ch and . is a sl st. the bold dots are the eyes and nose buttons or French knots. the shaded areas are the br and the white areas are the white. 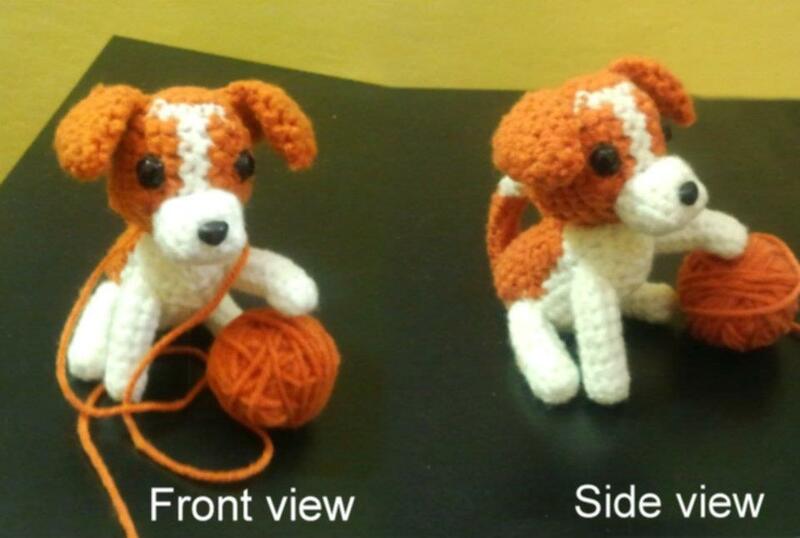 i hope this helps everyone who needed a "pattern"
use a bigger hook or hds or dc to make a bigger dog but be aware that bigger hooks and stitches will leave gaps in your doggie. OMG! These are the cutest ever! Kittykill should see these! You make me wish I could crochet better. This rocks! @I Sew Cute- Thanks for your comment.I am not a so skilled crocheter either,i learned how to crochet in 2011.Since then i am addicted to making amigurumis.Be patient n keep practicing so that you will too make cute amis...I find almost all amis too adorable...and when ever you crochet something,have confidence that it will look good and try to see it in your mind.The finished product will sure end up looking good.I always did it whenever i crochet. I may not know everything, but I do know a lot. Very cute. He looks fantastic. Lovely dog. I wish I knew how to crochet. He is absolutely adorable! You have great skills. And thank You so much for the link. I wish I had a real Jack Russell but my hubby won't let me (well, he's right because we have a Nova Scotian Retriever already). Now I can have as many as I want! So cute! I must make one to look like my puppy! Awww!! That is soooo adorable!!!! Ever think of doing a beagle?